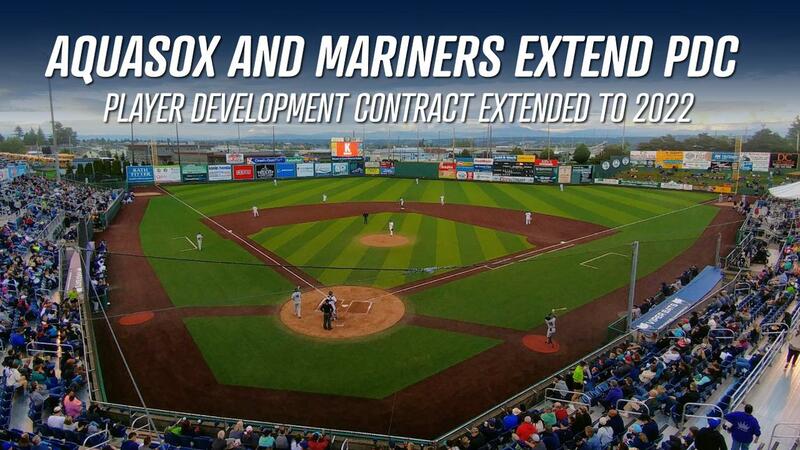 Everett, WA - The Seattle Mariners and Everett AquaSox announced today a two-year extension on their current Player Development Contract (PDC) that will extend the agreement through the 2022 Northwest League season. "We have truly hit it out-of-the-park with the Mariners these past 24 seasons." General Manager Danny Tetzlaff shared. "The new playing surface installed this season gave the Mariners' players a high-quality field to call home and a product our fans have come to love as well! I can't wait to share what we have in store for 2019." The affiliation between Everett and Seattle began in 1995 and is currently the longest partnership in the Northwest League. Over 24 seasons (1995-2018) the AquaSox have posted an overall record of 908-914 (.498). Since becoming a part of the Seattle Mariners minor-league system, the AquaSox have drawn 2,443,774 fans (avg. 101,824), made seven playoff appearances, won three North Division titles, made three championship series appearances and won one Northwest League Championship (2010). AquaSox players and field staff have been recognized for their excellence over the course of the successful partnership, including 42 end-of-season All-Stars, six Northwest League MVPs, two manager of the year selections and two batting champions. Everett has produced numerous Major Leaguers during their affiliation with the Mariners, including current M's Felix Hernandez, Mike Zunino, Matt Festa, Erasmo Ramirez and Nick Vincent. "Partnering with Everett for another four years fulfills multiple goals for us," Mariners Director of Player Development Andy McKay said. "Aside from the geographic convenience, the AquaSox, with leadership of both Danny and Pat (Filippone), provide our players with a first-class environment. Their commitment to our players is evident with the upgrades that they have spearheaded to the ballpark. We will continue to reciprocate by providing the best on-field product that we can while continuing to impact the surrounding community through our community service initiatives." In addition to being the home to players just beginning their career, Everett has served as a great place for Seattle Mariners to rehab from injury. During the 2018 season Robinson Cano, Hisashi Iwakuma and Rob Whalen visited Everett. "It is our pleasure to extend our current PDC for another two years with the Seattle Mariners. The partnership between our organizations has been fantastic both on the field and off." Seventh Inning Stretch President Pat Filippone said. "We look forward to continuing to grow the relationship well into the future."